Who said an exclusive evening with Gino D’Acampo couldn't be fun. Raising the bar with the best of Italy, the UK’s favourite chef returned to his Hull restaurant for a one-night extravaganza. Inviting and treating 200 guest’s to an exclusive four course menu and a warm welcome complemented by one of the widest selections of Prosecco to be enjoyed on arrival. Gino opened his first restaurant at the age of twenty-one called Bread and Wine, which was situated within Italy. His love for food started to grow and from then on become a worldwide success. 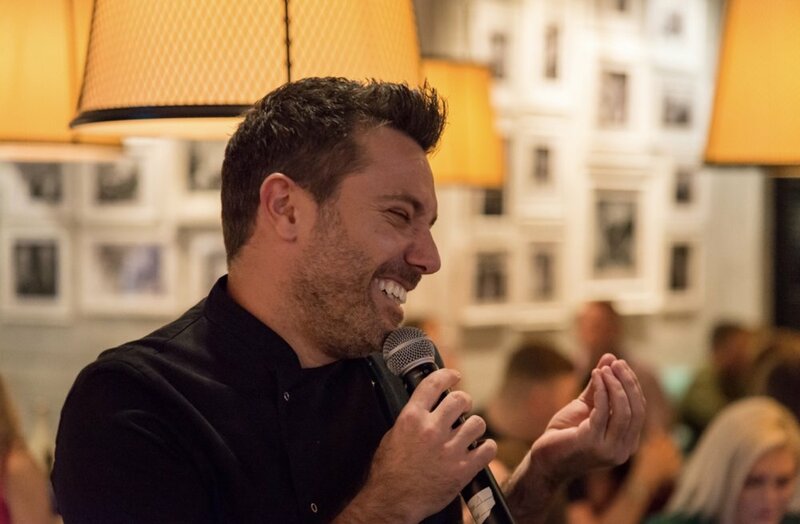 In December 2015 Gino opened up his first UK restaurant at the Corn Exchanged in Manchester and more restaurants are now opening up throughout the UK. With the drinks flowing and the atmosphere bubbling, the guests had the chance to ask the Italian chef and popular TV presenter questions. One of those, which had everyone laughing was the famous chip spice question- Gino do you know what chip spice is? Being born and bread from Hull, this has to be my favorite from the night. Gino replied; what’s that? For those of you who don’t know its Hull’s signature spice usually used on chips. Looking at Gino’s face he looked puzzled, but happily answered every question and filling the beautiful open plan restaurant with laughter. The beautiful designed menu really showed us Gino’s personality and his love for Italy. Featuring the finest Italian produce every dish was created and designed by the popular chef for the evening, which Gino talked through before dishing the most beautifully crafted pieces, which looked too good to eat. I asked Gino, what’s his must secret ingredient he uses mostly in his food, to my surprise he replied; I don’t really have a secret ingredient, but I think everyone should always have a good bottle of extra virgin olive oil, a bottle of balsamic vinegar and a packet of pasta in. There should always be a Parmesan cheese in the fridge! Guest’s tucked into olives, mozzarella Parma ham, Italian bread followed by prawn, pea and broad bean risotto. Then duck with green beans in a cranberry sauce with red wine to complement the dish and a selection of desserts. One I was very impressed with my favorite the tiramisu, outstanding tastes all night the palette couldn't resist – this is definitely food to thrill. Gino is not one to disappoint cooking for some of the most respected celebrities within the industry. Gino states; I loved cooking for Cilla Black. I taught her how to make the perfect Yorkshire pudding; we were on This Morning together and she asked me to show her the best recipe. I remember thinking it was crazy – an Italian teaching Cilla Black how to make the best Yorkshire pudding! The evening finished off with everyone dancing and shouting eccezionale (Awesome) It’s certainly a restaurant that expresses Gino’s Italian and traditional routes. You can try Gino’s beautiful food creations at any of his restaurants around the UK. What place inspires you to cook? Campania, Naples – where I come from. The ingredients are all so fresh and colourful. I think it’s the best region in Italy as far as food is concerned; you’ll find the best buffalo mozzarella, tomatoes, pasta and pizza. With your restaurant opening in Hull, what was your initial idea around the opening? Hull was the third restaurant I opened in Yorkshire and now I have four, which is testament to how much I love the region. It’s a thriving city and the people make me feel so welcome every time I visit. I wanted to open a restaurant that would bring real, Italian food to Hull, for all the family to enjoy. I wanted a space that wasn’t only about great food, but also somewhere you could come to spend time with family and friends. What’s your favourite dish to eat and cook? Anything to do with pasta. It’s so simple, versatile and tasty. Growing up, I don’t ever remember having a meal with my family where pasta didn’t feature, and my love affair has continued ever since. You don’t need to spend lots of time or money to create a fantastic dish – just throw together some pasta, chilli, chopped tomatoes and good quality extra virgin olive oil and you’ve got a tasty, quick meal. Outside of Italian food, my favourite food to eat would have to be fish and chips – we have it every week in my house. If Asset Intelligence came round to your house, what dish would you serve to us and why? Definitely pasta. I’d probably make you my favourite pasta dish – Linguine Puttanesca. It’s so tasty and can be made with store cupboard ingredients: olives, capers, chilli, oregano, anchovies, and a tin of cherry tomatoes. Will we see more of Gino’s fabulous cooking programs? Absolutely. I’ll be returning to Italy later this year to film the next series of Italian Escapes, which will be called Italian Express. I’m excited to discover parts of the country that I’m less familiar with. If there was one chef that inspires you that you could meet whom would that be and why? There are so many other chefs that inspire me, but I’d have to say my biggest inspiration is my Grandfather, who taught me how to cook. When I was 11, I walked into his restaurant and decided that cooking was what I wanted to do. What’s Gino got planned for 2019? I have a super busy year ahead, which I’m very excited about. I’ll be filming Italian Express, writing my new book and returning to the road with Gordon and Fred for our next Road Trip series. What makes a good dish? I don’t believe you need lots and lots of ingredients to make a great dish. For me, it’s all about the produce - if the ingredients are top quality and full of flavour, why would you want to cover up or change their taste? What’s the most important thing to think about when cooking? Again, I think it’s important to keep it simple. Cook what you love and use good, fresh ingredients. Put on some music, have a glass of wine and follow your favourite recipe – enjoy it! Where will we see Gino in 10 years’ time? I’m very much a ‘live in the moment’ person, but I hope that in ten years’ time, and for many more to come, I will still be doing what I love: cooking, writing books, making TV shows and spending quality time with my family.